I have always liked garments with seams. I understand seamed garments. My mind visualizes in flat patterns, that can be put together to create a new form. However, I’m slowly learning seamless knitting techniques, which means little to no finishing! In my opinion that is pretty awesome, except for one small detail…picking up the stitches. I’m sort of terrible at it. I always pick up too many or too few stitches than what the pattern calls for. I am knitting a beautiful summer shrug in Berroco Maya right now, which required me to pick up a lot of stitches over a large space.I asked my trusty and talented coworker, Alison Green, for help. Alison suggested breaking up the large space into even sections with markers. I use pins and markers all the time when working, but it never occurred to me to use markers in this context. It’s brilliant! First, I measured the distance of the area where I needed to pick up stitches. Then I roughly divided that in half on both the front and back of my shrug and placed a marker. I divided that space in half again and placed a marker, ending up with four sections. 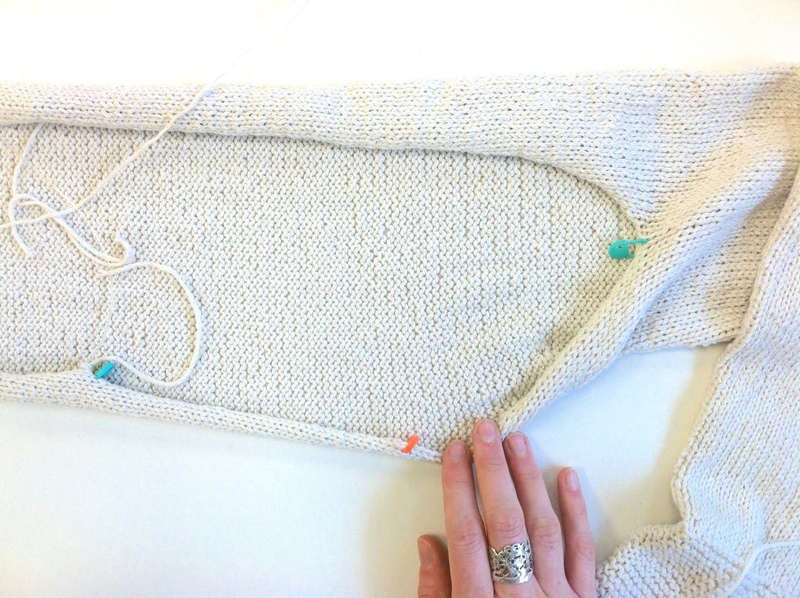 The best part about this approach is that it’s easier to judge how many stitches to pick up over a smaller space. When you start picking up stitches, make sure to follow the same vertical line for the entire length. A general rule we use in the office is to pick up 2-3 stitches, then skip one, and repeat. Do this for the entire length of your fabric. 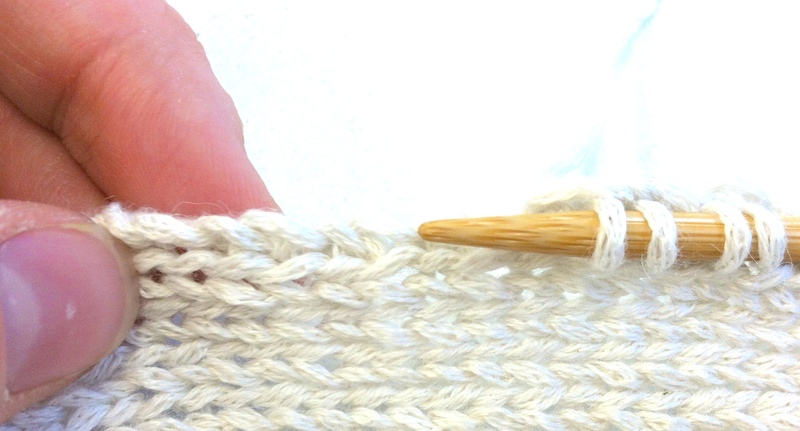 I hope these tips help you pick up stitches in your next project. I use Eunny Jang’s method – place your markers at one inch intervals, and then pick up the stitches based on your stitch gauge. No more guessing and trying to space things out over the long sections by only halving and/or quartering the piece! Works well around curves of necklines as well as long stretches like button bands! I think I am going to use more markers next time too! Thanks for the suggestion! You learn something with every project you do. I do not understand why would you pick up stitches then skip one wouldn’t that show on your garment? When you are picking up stitches along an edge the knit stitches are wider than they are tall, so skipping a stitch will not show on the garment. It will blend together beautifully. Absolutely brilliant – THANK YOU for this! Another way is to pick up evenly over whole row, then decrease by knitting 2 together to reduce number of stitches if there are too many.